Hardwood flooring is gorgeous, easy to maintain, and works well in a wide variety of design plans. Hardwood flooring is gorgeous, easy to maintain, and works well in a wide variety of design plans. If you’re looking for a new floor for your kitchen, consider hardwood flooring. 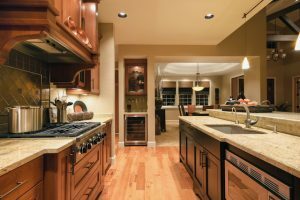 Due to the amount of moisture that is often present in a kitchen, certain wood species are better-suited for the job than others. Here are a couple of wood species that make good kitchen floors. Brazilian cherry is considered one of the toughest types of hardwood flooring out there. Because of its deep red-brown color and character marks, it camouflages dirt and scuffs well. It also has a Janka hardness score of 2350, so it is quite strong and can easily stand up to the high traffic of a kitchen. Oak has been one of the most popular wood species for flooring for hundreds of years, and it will make a great addition to your kitchen. Oak has a variety of grain patterns and looks beautiful with many different finishes. It’s not as hard as Brazilian Cherry, but it is still plenty tough enough to stand up to kitchen foot traffic. Bamboo is one of the most cost-effective types of flooring. It takes very little time to mature, so it is a good environmentally friendly alternative to traditional hardwood flooring. It is available in shades ranging from light tan to dark, chestnut-like brown so it will be easy to find the perfect bamboo floor for your kitchen. Acacia floors have a distinct appearance due to the unique character markings in the wood. It stands up to dents, dirt, and scratches well and is a good, durable flooring choice. Acacia wood varies in color, so it will match whatever design or color scheme you choose for your kitchen. This entry was posted on Thursday, March 15th, 2018 at 3:37 pm. Both comments and pings are currently closed.